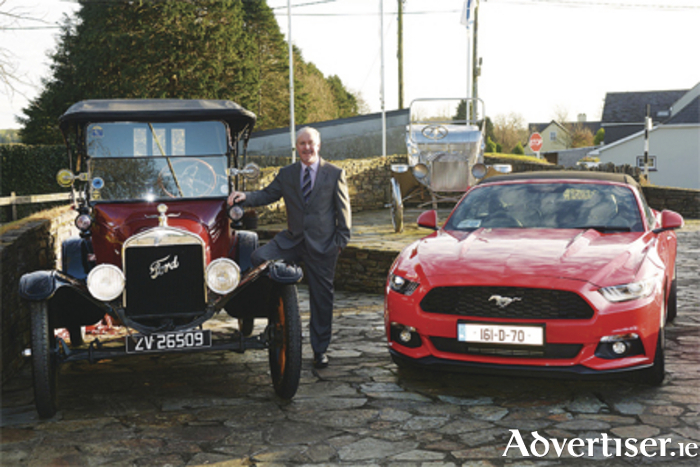 Pictured at the Ford family memorial in Henry Ford’s ancestral village of Ballinascarthy, Co Cork, is Ford Ireland chairman and managing director, Ciarán McMahon, with the ‘old and new’ of Ford: an original Model T and the new Ford Mustang, which was launched for the first time in right-hand drive in Ireland during 2016. In just a few months it will be exactly 100 years since Henry Ford established the Ford factory on the Marina in Cork City, and Ford Ireland plans to mark the centenary through a number of exciting initiatives in 2017. The Ford Motor Company was set up in the State of Michigan in the US by Henry Ford in 1903. True to his roots, just 14 years later Henry opened the first purpose-built Ford factory to be located outside of North America at the Marina in Cork. Mr McMahon said the company is also looking to the future as it plans for the next century of business in Ireland. In celebration of Ford's 100 years in Ireland, Fred Kilmartin's 171 'Real Deal Event' is offering up to €4,250 on the New Kuga Titanium+ model. Alternative Real Deal savings are available on other models across the range.